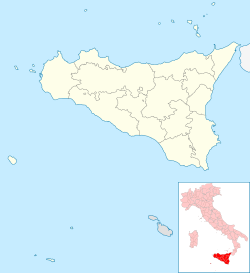 Bisacquino (Sicilian: Busacchinu) is a town and comune in the Metropolitan City of Palermo in Sicily, Italy. It is located 82 kilometres (51 mi) from Agrigento and has approximately 4,500 inhabitants. The small town rises on an inner hill zone and is 663 metres (2,175 ft) above sea-level. The economy is based on agriculture and products are sold in abundance in the main town including cereals, olives, vegetables, almonds, hazel nuts and wine-grapes. Sheep breeding is also active in Bisacquino. The name Bisacquino derives from an Arabic farm house Busackuin meaning "rich in waters". In the 12th century it was owned by local lords until 1778 when it became a property of the archbishop from Monreale. The Sanctuary of the Madonna of the Balzo near Mount Triona was erected in 1678. The main church is the Cathedral Church of Bisacquino which is dedicated to John the Baptist. It was built in 1713. Mafia boss Vito Cascioferro (1862–1945). ^ a b c d e "Bisacquino". Sicilia.indettaglio.it. Retrieved September 23, 2009. This page was last edited on 19 July 2018, at 08:27 (UTC).